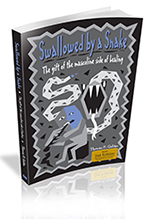 Swallowed by a Snake: The Gift of the Masculine Side of Healing was Tom’s first book. It goes into detail about the nature of grief from a more masculine perspective and opens the dialogue about how and why men and women process emotions differently. Offers chapters on our own culture and indigenous cultures and their differences in grief rituals. Endorsed by Elizabeth Kubler Ross, Robert Bly, Hope Edelman and others, it has become a classic in the bereavement world. paperback or ebook.